There was a big Canada Day celebration at work, and I volunteered to bake a Canadian dessert. I actually don’t like Nanaimo bars; I don’t like coconut in desserts, and I really don’t like the overly sweet custard layer. I wanted to make these with a twist, so I decided to swap the custard layer for a creme patissiere layer. Several people told me that these were the best Nanaimo bars they’ve ever had, so I think it was a winning decision. You could make the argument that they aren’t truly Nanaimo bars anymore, but I’ve decided they’re objectively better. I made a really giant amount of this (13″ X 18″ pan), so the recipe below is halved for a 9″ X 13″ pan. 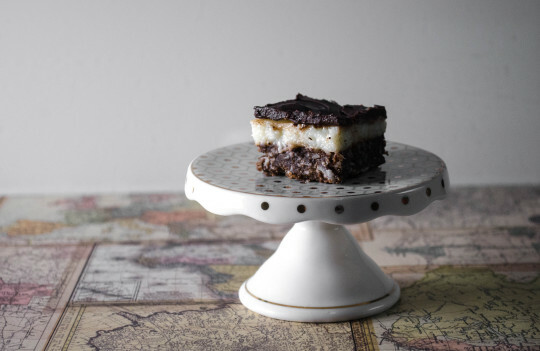 Parts of the recipe are adopted from this Nanaimo bar recipe. On a bain marie, mix together the butter, sugar, and cocoa until melted and smooth. In a bowl, mix together the two eggs. Pour a little bit of the hot chocolate mixture into the eggs and mix rapidly to temper the eggs. Pour the egg mixture back into the chocolate mixture and mix until thick. Press into the pan in an even layer. Pour ¾ of milk into a saucepan, and ¼ into a separate bowl. Put the saucepan over medium heat, and add in the split vanilla pod and seeds. Dissolve the sugar and cornstarch into the bowl, and then mix in the yolks. Whisk extremely well to get out any lumps. When the milk comes to a boil, pour half of it on the egg mixture (and mix well) to temper the eggs. Then add the egg mixture back into the saucepan, and whisk hard! When it starts to boil, take off heat. After it has cooled for a few minutes, pour onto the graham layer. Cornstarch binds at 72˚C, but it’s a good idea to cook until boiling. Melt the chocolate and butter over a bain marie. I chilled the pastry cream first, and this was a big mistake. The pastry cream completely set and the chocolate didn’t adhere at all to the other layers.